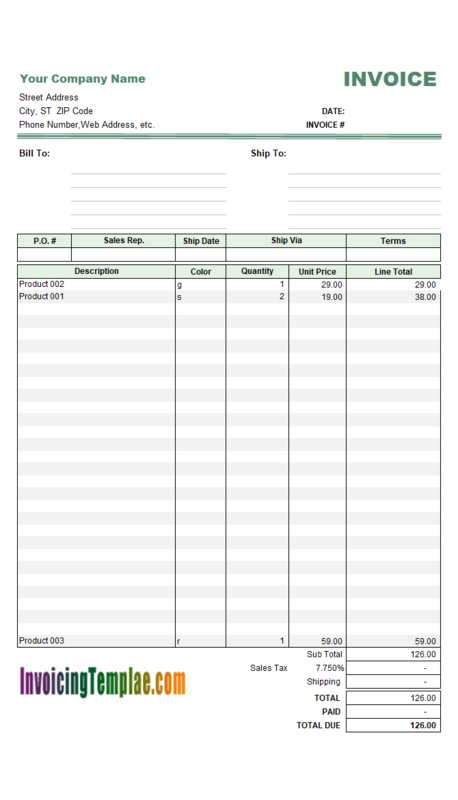 c5001 now includes the customized invoice template for the latest version of Invoice Manager for Excel. 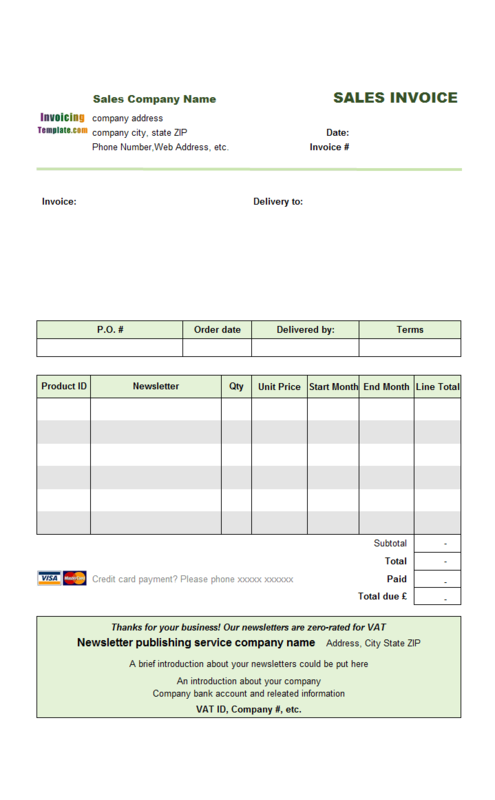 This is what you will see when you open invoice-template-tax-column.xlsx. 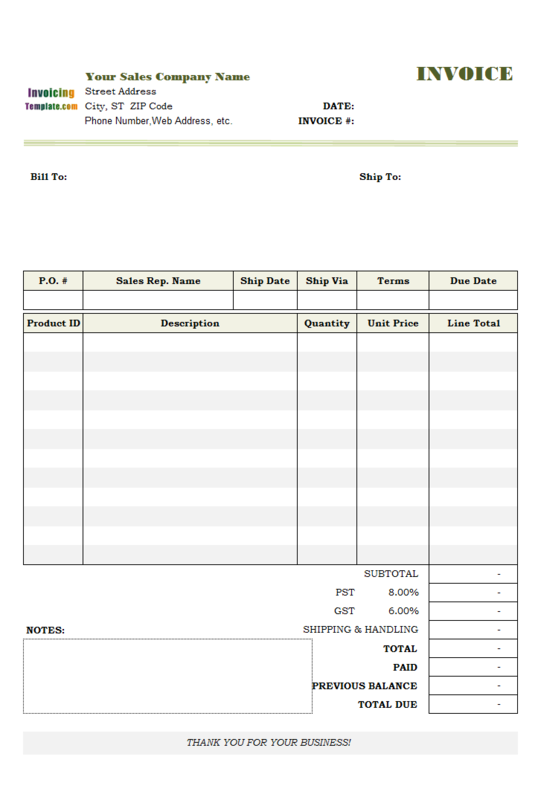 The heading part of the invoice form, including your own company/business information section, invoice#, invoice date, "Bill To" section and "Shipping To" section are similar to the default sales invoice template included in Invoice Manager for Excel setup program, which you can download and try for free, and is able to upgrade a simple Excel formatted invoice template to a fully featured invoice program. 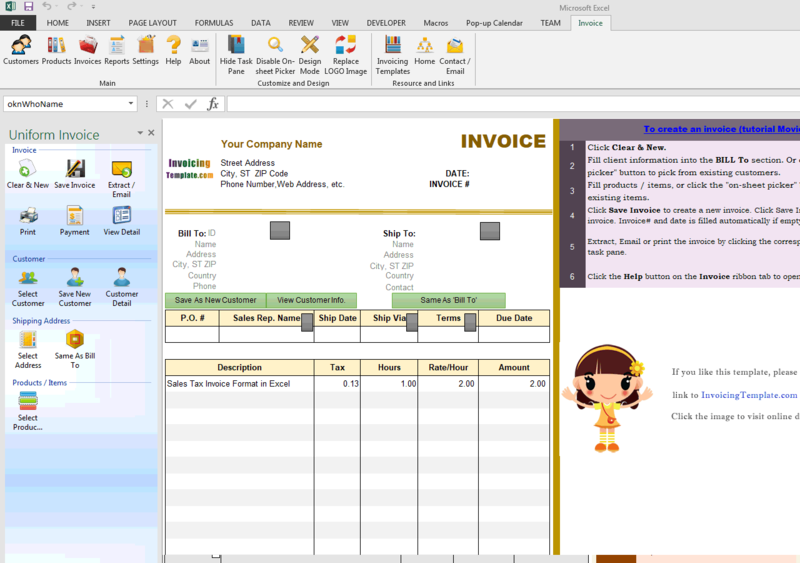 With Invoice Manager for Excel installed, your Excel invoice template will not be a simple invoice creator, it will be powerful invoicing that includes features for managing customers, products/items, invoices and payments. 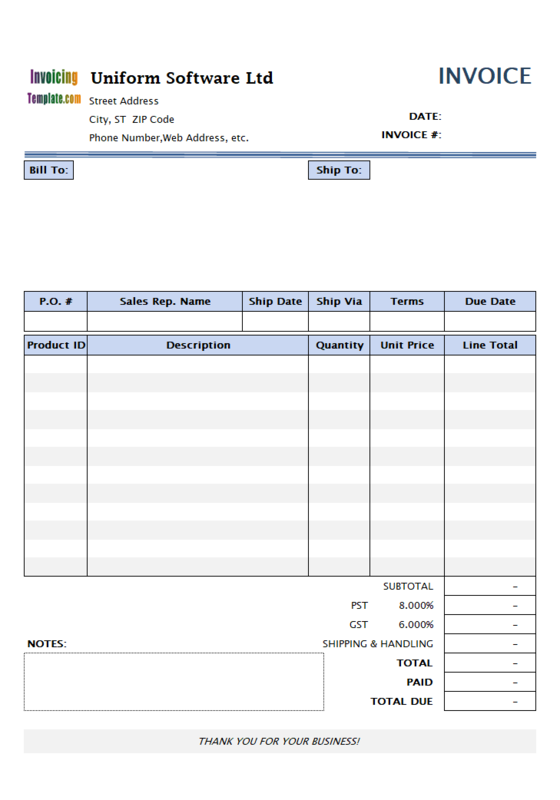 Although the invoice template includes fields for shipping information, the body part has columns titled with "Hours" and "Rate/Hour". 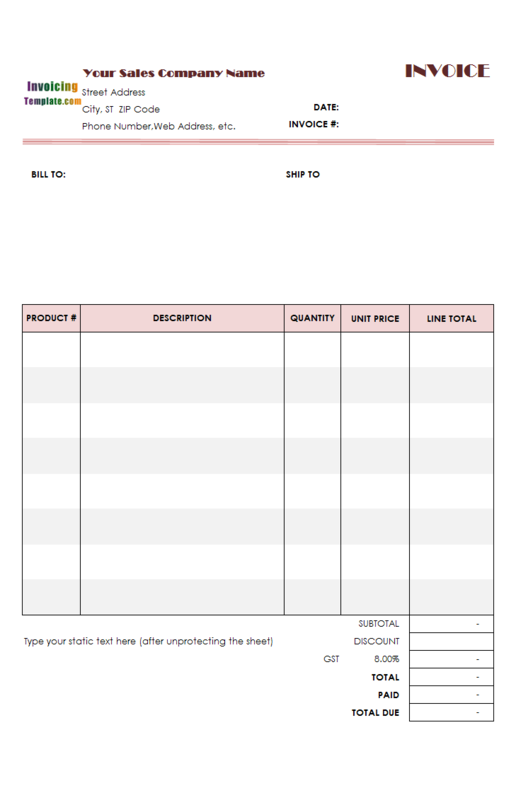 If you don't like these two headings, you can easily change them to Quantity and Unit Price by simply unprotect the Invoice worksheet and then type in your own text labels. 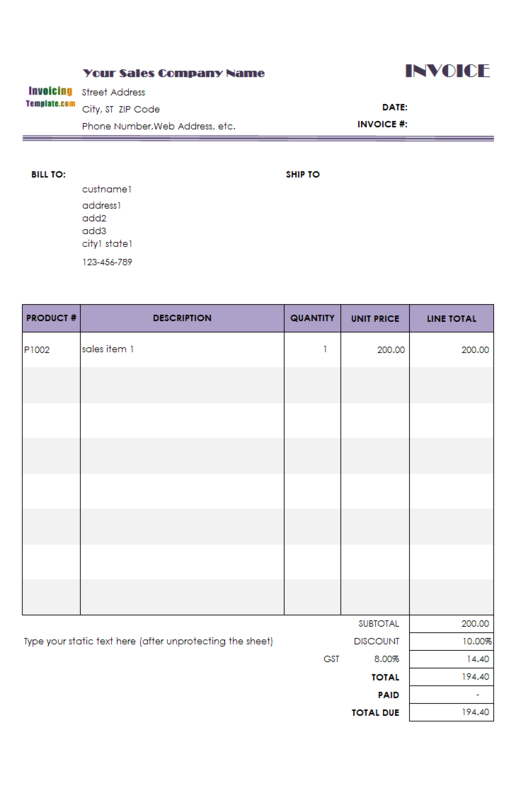 However these are not the interesting parts of this invoice template. 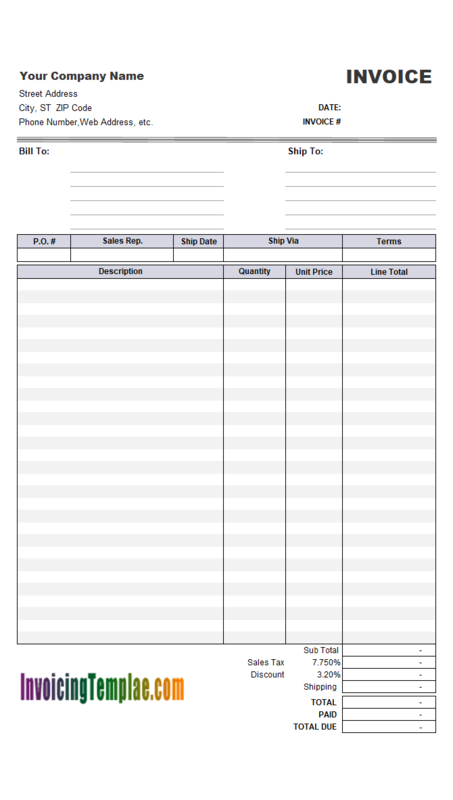 The special point of this invoice template is that it includes a Tax column, which shows the tax amount calculated based on tax rate (specified on the bottom of the form), line total and status of the "Taxable" checkbox. 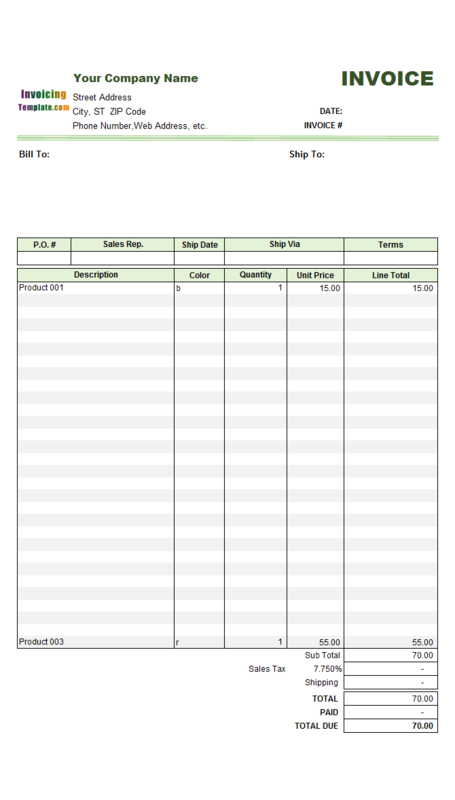 The Excel formula of the tax amount cells are like the following. 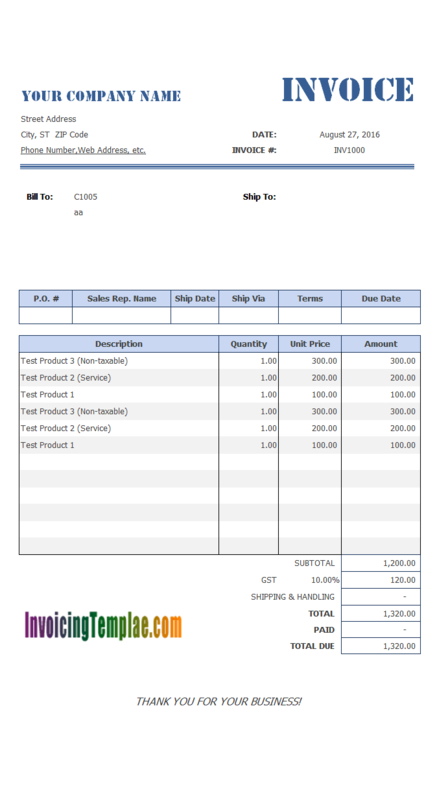 This formula means that, if the "Taxable" checkbox is checked on the first line of the invoice body (identified by the " oknTaxable_1" cell value), it calculates tax amount based on line total and tax rate. If the "Taxable" checkbox is not checked, it shows either an empty string or the symbol "-" depending on whether the line total is zero. 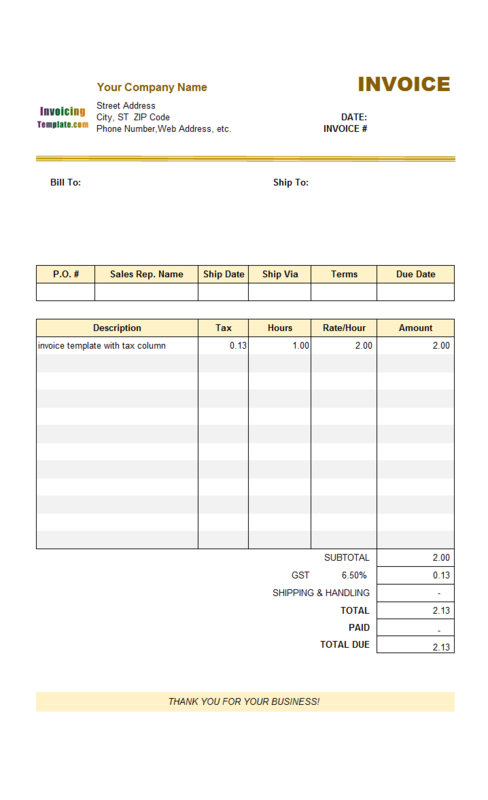 The checkbox column titled with "Taxable" is put outside the printable area, which is not printed when you execute the print command in Excel, or is not extracted when you execute the "Extract" command when Invoice Manager for Excel is installed. 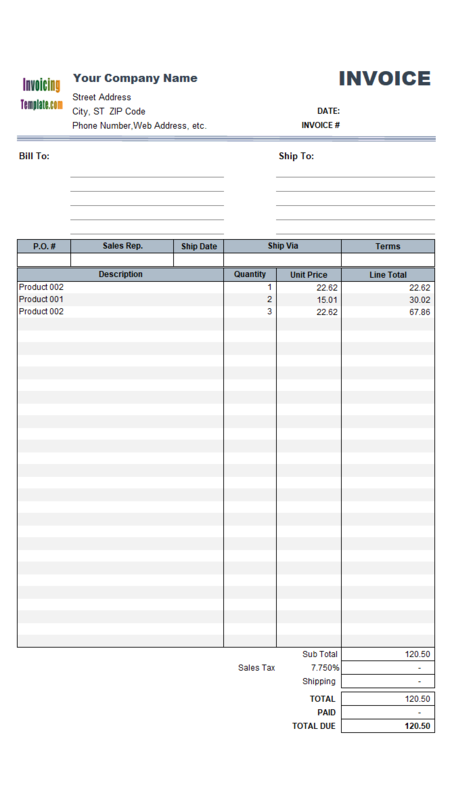 So can the "Taxable" checkbox column be included in the printed version of an invoice? The answer is "Yes". 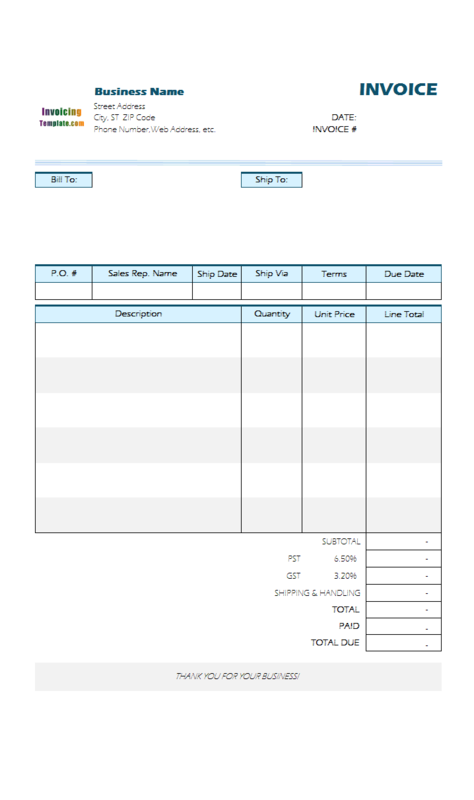 Basically what you need to do is just to move the checkbox controls inside the printable area, and then name them with special prefix so that Invoice Manager for Excel will not remove them on extracting an invoice. 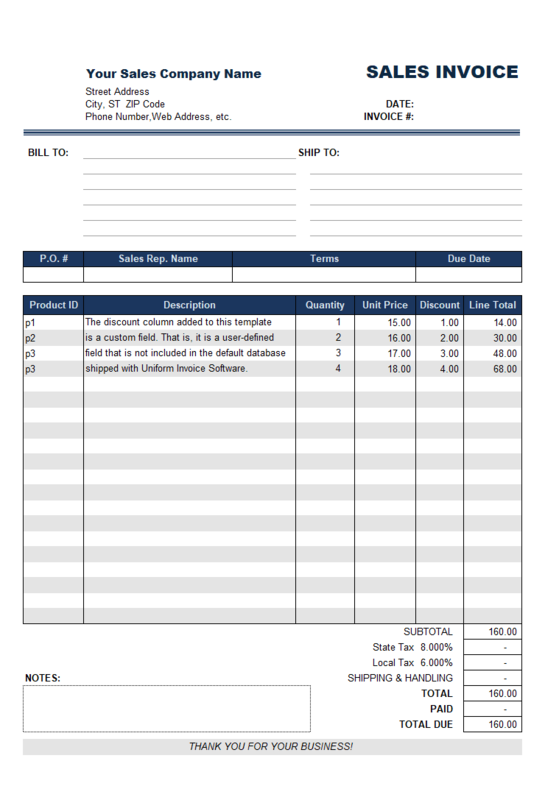 Please refer to the Invoice Manager for Excel document, which is included in the installer program, for more detailed instructions on how to customize the invoice template. 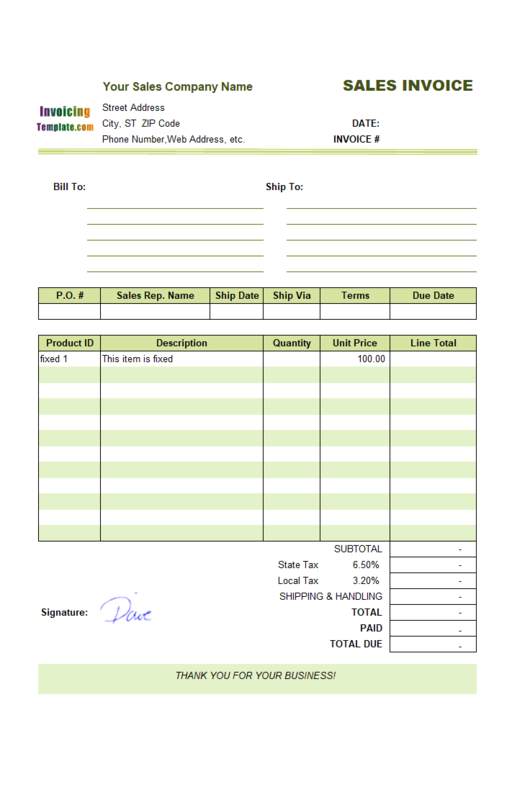 Like other form designs here on InvoicingTemplate.com, Sales Tax Invoice Format in Excel is free (offered to you at a price of 0.00USD). It works on Windows XP and all newer versions of Windows, and Excel 2007, 2010, 2013 or 2016. Added the "round" Excel formula to both the "Tax" and "Line total" column, so that it always results in two digits after the decimal point (to the max). 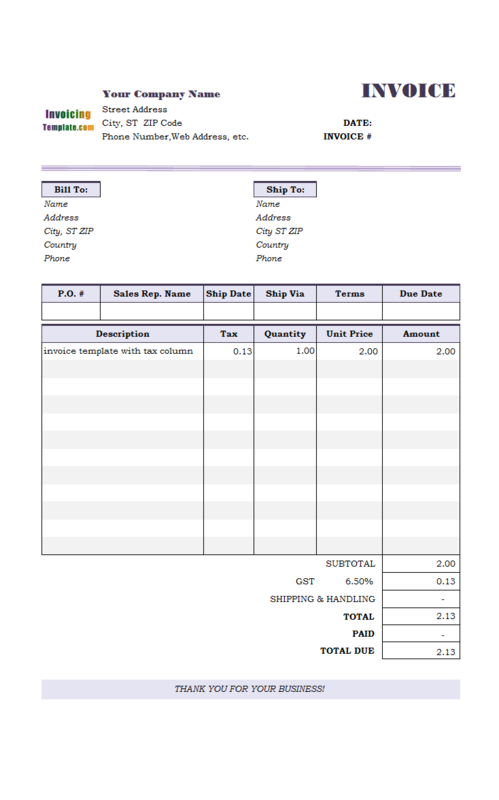 See Excel Formula to Fix the Decimal Size Warning fore more information. The "Select a product" buttons were resized.